आपल्याला आठवत असेल की मागील ३ वर्षे आपण मारवाडी मित्र मंडळ, सिंधी असोसिएशन आणि गुजराती सोसायटीबरोबर एकत्र होळी साजरी केली होती. आपल्या सभासदांकडून या उपक्रमाला छान प्रतिसाद लाभला होता; त्यामुळे यंदाही आपण असेच, एकत्र रंग खेळायला जमणार आहोत. गेल्या वर्षी प्रमाणे कटॉंग सीसी देखील त्यात सामील होत आहे. यावर्षीही सारं काही तसंच असणार आहे, कार्यक्रमाचं स्थळ देखिल. लकी ड्रॉ, live performances, बक्षिसं सगळं असणार आहे! मग कसली वाट पाहताय दोस्तहो, नक्की या होळी खेळायला ! भेटू च..
You would remember our combined colourful holi celebration last 3 years in collaboration with Marwari, Sindhi and Gujrati association. It received a huge response then. We are bringing the same opportunity of having a fun holi together this year for you. We are also joined by Katong CC second year in a row. Format of the programme remains same as last year - only the venue has changed. Holi colours & food will be available to purchase. So what are you waiting for. Register and invite your friends too ! 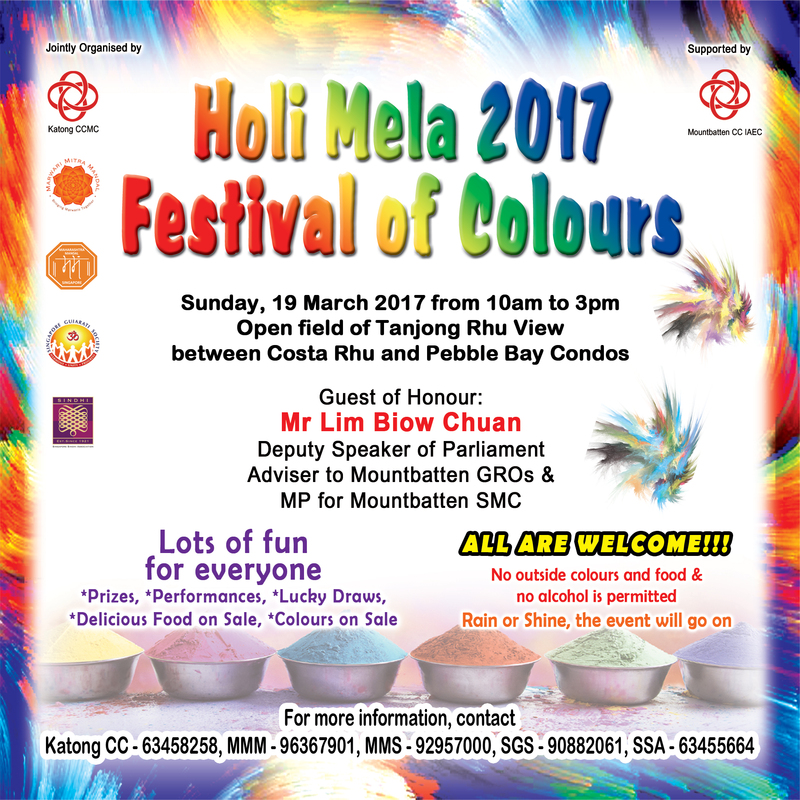 It is the best FREE and community holi in Singapore.